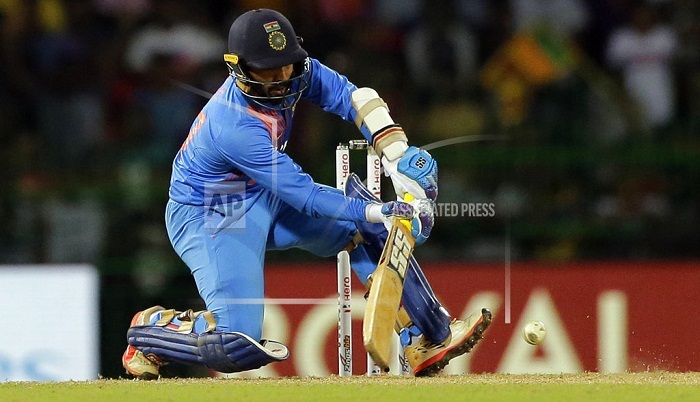 Wicketkeeper-batsman Dinesh Karthik hit a last-ball six in his blazing cameo to help India edge out Bangladesh by four wickets and clinch the Twenty20 tri-series title in Colombo on Sunday, AFP reports. Karthik hit 29 off just eight balls to get India past their 167-run target in a tense chase of a dramatic final at the R. Premadasa Stadium. Needing 12 to win off the last over, India lost Vijay Shankar on the penultimate ball but Karthik held his nerve to hit Soumya Sarkar for six, triggering wild celebrations in the dressing room. Skipper Rohit Sharma gave the team a blazing start during his 42-ball 56 but his wicket gave Bangladesh hope of turning it around. Number-five batsman Manish Pandey also made a crucial 28 but returned to the pavilion with India requiring 34 in the last 12 balls. Karthik then stepped up to clobber paceman Rubel Hossain for two sixes and two fours as India took away 22 runs in the 19th over to make the equation easy. Rubel claimed two wickets in his four overs. Earlier put into bat, Bangladesh rode on Sabbir Rahman's 50-ball 77 to post 166-8 against a disciplined Indian bowling. Leg-spinner Yuzvendra Chahal claimed three wickets to rattle the Bangladesh batting early including the prized scalp of the in-form Mushfiqur Rahim for nine. He returned figures of 3-18. Sabbir then went after the Indian pacemen Vijay Shankar and Shardul Thakur, who gave away 93 runs between them. Left-arm quick Jaydev Unadkat struck late to get two wickets in an over as he finally got Sabbir, who hit seven fours and four sixes, bowled on a slower delivery. India, who just lost their opener against hosts Sri Lanka in the tri-series, kept their T20 record clean against the Tigers in eight meetings. Sri Lanka bowed out of the tournament, which commemorated 70 years of independence for the island nation, after losing to the Shakib Al Hasan-led side in a virtual semi-final on Friday.